Once there was a little gardener who lived in his garden. The garden meant everything to him. He was not very good at gardening, but he worked very hard to take care of his garden. There was only only problem: he was too little. He was on the verge of giving up, but then he saw a beautiful flower. It made him work harder every day and every night. Despite his efforts, the garden slowly started dying. He desperately wanted help. The following day, someone walked by the garden and noticed the flower. It was a young girl. She was filled with the same hope as the little gardener upon seeing the flower. She and her friend tended to the garden, while the little gardener was in hibernation. When he awoke, he was delighted to his garden alive and well. He realises that his garden cares about him as much as he cares about his garden. The illustrations are magical, dark, irregular, and lush, depicting different shades of green. The essence of the story is conveyed through the illustrations. The rhythmic narration of the story in concise and precise language will be striking to young readers. end, he also realises that he and the garden cannot survive without the other. He needs the garden for food and shelter and the garden needs him to nurture it. children to understand the connection between humans and nature and the importance of environmental conservation. It can inspire them to take action against environmental destruction. The story focuses on perseverance and transformation: little things can make a big difference. 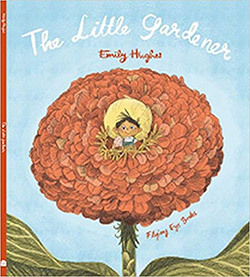 The red flower is a symbol of hope to the little gardener and the young children. It makes them work harder to take care of the garden.